When mapping networks we often ask ourself: Is this one actor or more than one. 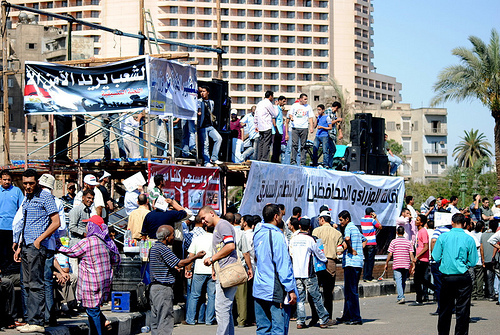 Let’s say you map out the transition in Egypt: Is the Muslim Brotherhood one actor or many? I heard an interesting piece on NPR this morning which makes me say: That depends. If you looked at pre-Arab-Spring Egypt and wanted to map out the different political actors in the country, you would most likely be fine calling the Muslim Brotherhood one actor. Not because as a group they were always united and following the same strategies and goals. But the opposition to the regime and Mubarak was such a strongly uniting force that differences in the detail would be much less obvious. But what happens if you loose your biggest enemy? All of a sudden the uniting force of that enemy is removed from the system and the result tends to be the same whether we are talking about the end of the Cold War or the end of an oppressive regime: The people who were united in the fight AGAINST something now have to define what they stand FOR and what used to look like just one actor will struggle to maintain unity. 1. A movement can completely fall apart after the enemy is removed from the system. 2. It may break up into two or more separate movements, e.g. more and less radical arms. 4. it can engage in an internal process of redifining its mission, integrating most of their members while finding either a new common mission or (easier) a new common enemy. So to understand the role of the Muslim Brotherhood in the new nation building process in Egypt, I would not map it as just one actor: It would make a lot of sense to have a closer look at the internal factions and individual leaders of the organization, in Egypt and abroad and see how they interact with each other and with other actors in the system. Two of the experts interviewed by NPR, Tarek Masoud (Middle East expert from Harvard University’s Kennedy School) and Nathan Brown (professor of political science and international affairs at George Washington University), seem to predict future 3: The Brotherhood will loose some of it’s members and then regroup around a strong core. I will not predict anything and remain curious to see what will happen. More interesting reading: CNN on the generational rift in the Brotherhood. The New York Times on how the election in Egypt exposes divisions in the Muslim Brotherhood.